I bought this to go with the coffee table by this same brand. Its a bit larger than I would have liked but like the coffee table it was easy to assemble and I will find a different spot to place it as I like the look of it. Purchased for a basement reno that I am doing. Currently I have a large table lamp on it and our *** and there is still tons of space to place other items. Form meets function. Designed by Angelo Surmelis, the Stratos Round Side Table is a striking accent that's perfect next to your sofa, chair or placed in the entryway. Inspired by Mid-Century modern designs, it features a round top with three angled legs for a tripod look. 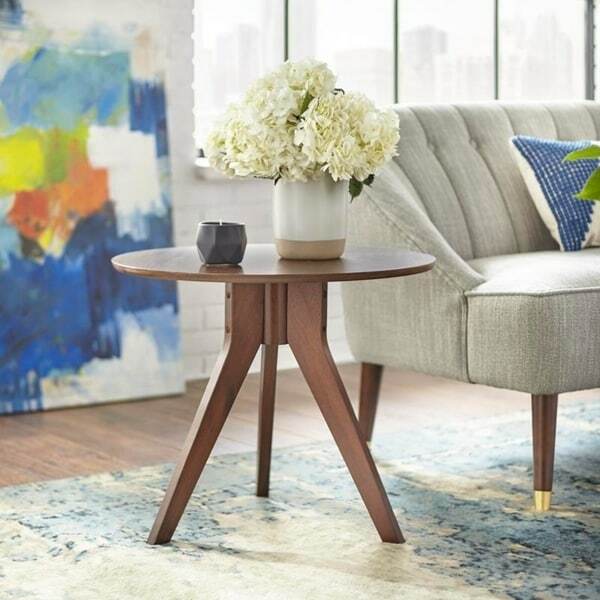 Crafted of sturdy wood legs and a veneered MDF top, the table features a deep Walnut finish that's easy to coordinate with other room colors. Dimensions 24.0 In. X 24.0 In. X 20.0 In. Highly recommend! We just finished our basement and these tables appear durable with just the right touch of cool for our active family. Easy to follow instructions!